My husband requested Chicken Kiev for dinner a few weeks ago and I honestly had no idea what it was. Before I looked it up, I pictured Chicken Kiev being one of those old fashioned chicken dishes you would find on an early-bird diner menu. 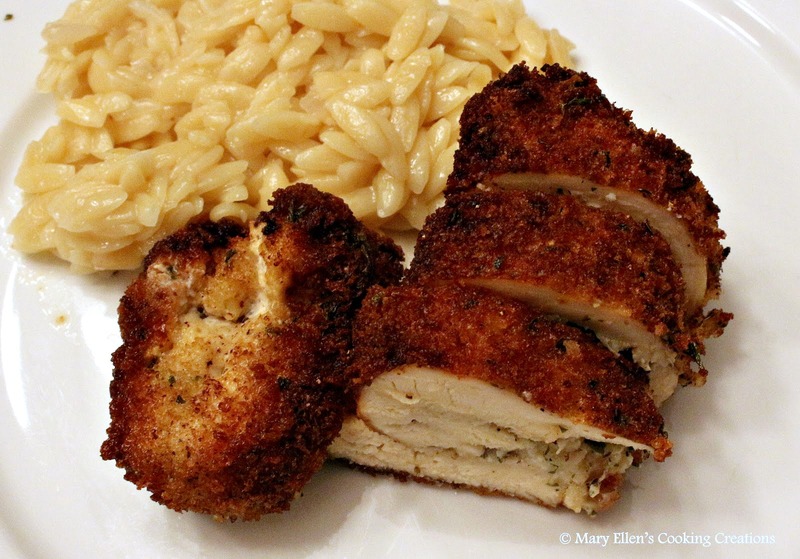 However, after googling I was really excited to try it - crispy rolled chicken stuffed with a savory butter? Ok! I went in search of the best recipe. My friend at The Way the Cookie Crumbles recommended the Cook's Illustrated recipe. I liked a lot about the recipe, didn't like some (like making my own bread crumbs and using tarragon in the butter), so I wanted to read a few more before deciding. That's when I found Alton Brown's recipe. It was a touch simpler and called for frying the chicken, whereas the CI recipe baked the chicken for 45 minutes. I decided to take what I liked from each recipe, added a few things of my own, and used a combination of frying and baking for a total of 15 minutes cooking time. I also trimmed my chicken and got it pounded out. An hour before dinner I stuffed and rolled the chicken and put them in the fridge, so all that I had left to do was bread and cook the chicken. You could easily roll the chicken the night before and just store it in the fridge until you are ready to start cooking. We liked this so much that we made it twice in a month. I'm glad we decided to fry the chicken - it got so crispy and sped up the baking time. And the butter - oh that butter kept this chicken so moist and tender. 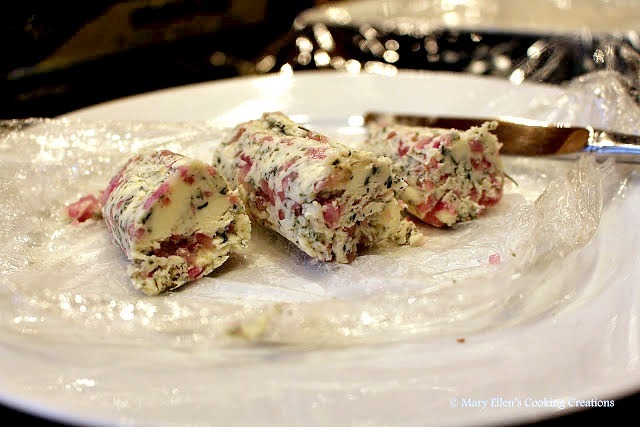 You could really season the butter any way you like - I see a lot of options for changing up the flavors with this one. You will need one pan for frying. For baking you will need a cookie sheet with a cooling rack resting on it. Make the butter: Mix the butter, parsley, garlic, shallot, lemon juice, 1/2 tsp Kosher salt, 1/4 tsp black pepper. Once mixed, place on a large piece of plastic wrap and form into a log. 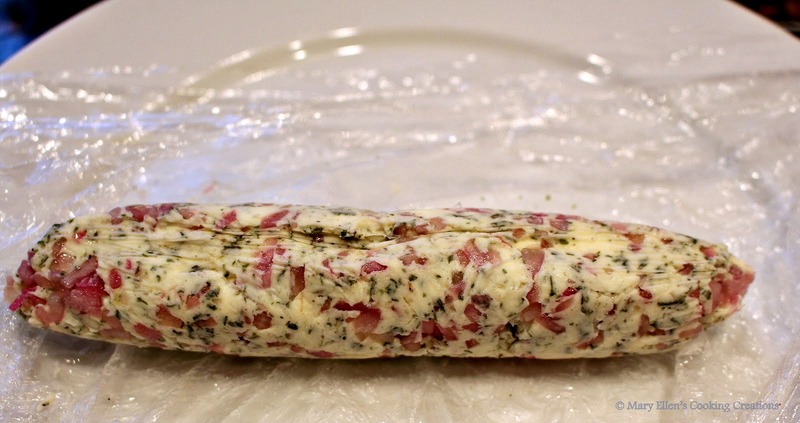 Roll the wrap around the butter and plan in the fridge overnight. Prep the chicken: trim your chicken (if needed) and pound it out as thin as possible without ripping (approximately 1/4 inch). When you are ready to roll the chicken, cut the butter into 4 equal sections. Lay one piece of chicken on a cutting board lined with plastic wrap and season the chicken lightly with salt and pepper. Place one section of the butter just below center of the chicken. Fold the side edges of the chicken in over the butter, fold the end over, and then roll the chicken to completely enclose the butter (use the plastic wrap to help you roll it tightly). Seal with a toothpick if needed. Repeat with remaining chicken. Refrigerate the chicken for at least 30 minutes or as long as overnight. Once you are ready to cook, preheat your oven to 350 degrees. Place a cooling rack on top of a cookie sheet. Put out three dishes for breading. Place the flour in one, the eggs, beaten, in the second, and the breadcrumbs seasoned with salt and pepper in the third. Heat the oil in a large saute pan. You want just enough to coat the pan generously, but not too much that you are deep frying sections of the chicken. Roll each chicken breast in the flour, shaking off any excess. Coat in egg, and then roll in the breadcrumbs. 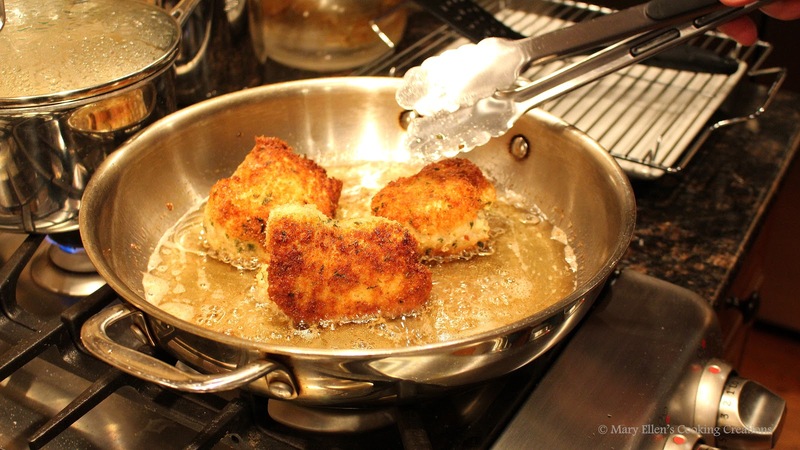 Once the oil is hot (about 350 degrees), place the chicken in the pan. Cook chicken on each side until brown, about 1-2 minutes per side. Once browned, place the chicken on the cooling rack and put in the oven to finish cooking, about 10 minutes or until the internal temperature reaches 160 degrees. Let rest 5 minutes before serving. Yum. I can't wait to try this. 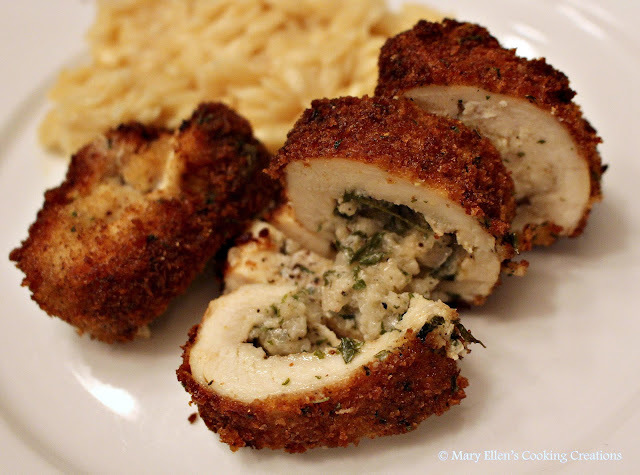 My mom made Chicken Kiev once when I was a child and I loved it. I've had it out once or twice but I've never made it myself. Even though I haven't had it in years, I'd say it's one of my favorite chicken dishez.